ASOS, asos fire, fashion news, fire, fire damage, Online shopping, Warehouse, warehouse fire, what happened to asos? ASOS warehouse caught fire last night. 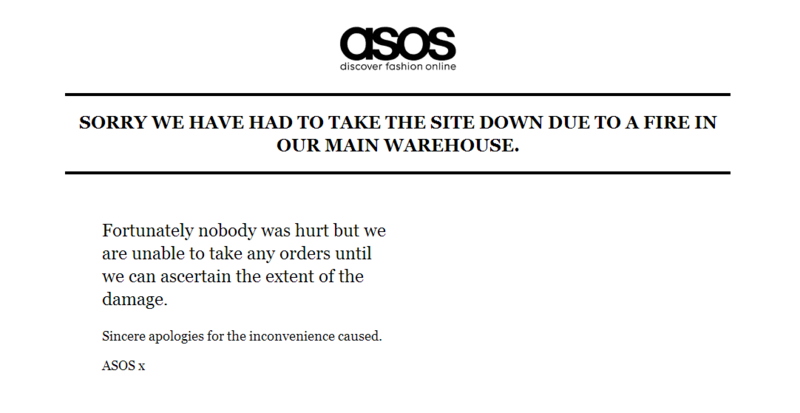 Fortunately no one was hurt but they have, understandably, taken asos.com down until they can assess the damage. ASOS is my favourite online store because they have great products and they provide great service to their customers. I hope the company recovers from this tragedy soon. Sometimes when you work you think of prices in terms of hours, for example ‘those shoes will cost me 5 hours pay’. I recommend this style of thinking if you need to look after your pennies because when you think of the hard work you have done to earn your money when you are considering a purchase it really curbs your spending. Well in most cases it does, but if you happen to shop at Shelikes.com thinking in terms of ‘price vs. hours’ probably won’t put you off your purchase. This dress costs just £3.68 ($5.68) (€4.30) (Prices converted on 20th June 2013) In the U.K £3.68 is the minimum wage for under 18s so for minimum earning 16 and 17 year olds this dress costs one hour’s pay. The dress is supplied to shelikes.com by Figa Store. 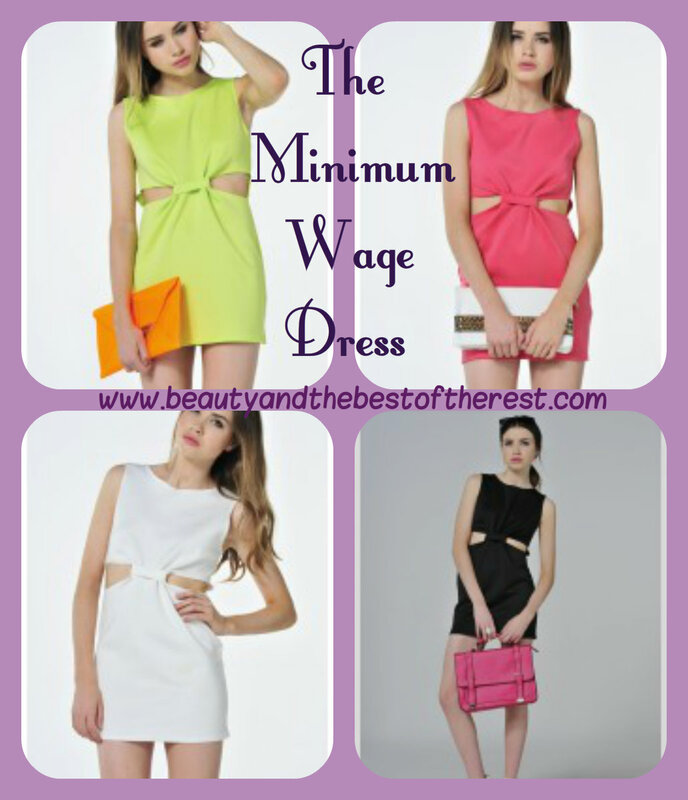 The Minimum Wage Dress – Only £3.68! A dress worth keeping! This spectacular cut out dress is the perfect choice for all your summer occasions. Featuring a cut out design & knot detail. Versatile & easy to wear, team with colour popping heels for the evening, or wear with hi top trainers & a customary denim jacket for the day. So what are you’re thoughts on all this? Do you think it is a wonderful idea? Do you wonder about the profit made on this dress? Would you like to know how the company can sell it so cheap? Do you think more companies should be selling items like this? What do you think about the dress itself? Do you like the style? The colours? Should they broaden the range of Minimum Wage Dresses available? Also what are your thoughts on different age groups having different minimum wages? Personally I think it is very unfair, if you do a job I think you should be paid as much as the other people who do the same job, age should not be a factor. Do you agree/disagree? I would love to get your comments about this. Don’t you just love it when a parcel arrives for you? I always feel like I have just recieved a present. This time I did actually recieve a present of sorts. I was sent the gorgeous Wavy Gold-Tone Necklace that you can see me wearing in the pictures below. It’s from www.oasap.com, one of my new favourite shopping sites. They have EVERYTHING. Clothes, Shoes, Bags, Purses, Accessories, Jewellery and Make up. My Wavy Gold- Tone necklace costs $17 or £11.05 or 14 Euros and 11 cents. I am so happy with this necklace, it adds a bit of elegance to any outfit and gold goes with everything. I haven’t seen anything like it in the shops so I probably won’t bump into anyone who is wearing something similar which is a bonus. I’m wearing it at the moment and I could easily forget that I’m wearing it, it’s not too heavy, it’s not scratchy and it doesn’t move about. The only negative that I can think of is that you have to be quite careful that all of the links are the right way around when you are putting it on because they can twist quite easily before they are resting flat against your neck but once the necklace is on and fastened it doesn’t move about at all. It ticks all of the boxes for me. 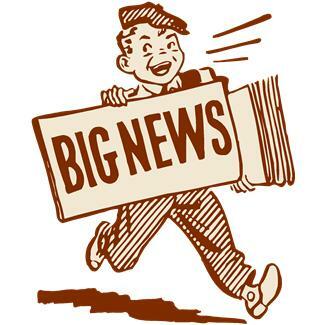 www.oasap.com is well worth checking out, the prices are reasonable, there will definately be something there that you love and they have free worldwide shipping. I love their blouses, bags and jewellery the most but all of their stuff is gorgeous. Just want to make it clear that I was sent my necklace free of charge for review purposes. That being said, when I next have some cash to spare, some of it will probably be spent at OASAP. Anyone already shop at OASAP? What do you think about their stuff? What have you bought?